Personalized red & white 44” arc barrister auto - open folding umbrellas are often perceived as good luck symbols by marketers because they know that people are going to start believing in them. 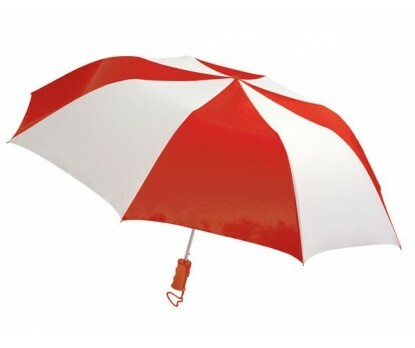 Promotional red & white 44” arc barrister auto - open folding umbrellas are largely ordered by marketers who had very frugal luck with their marketing investments. This umbrella features a metal shaft, carrying strap with plastic handle, and convictional 44” arc red & white canopy. Imprint area – 9 ¼ “W X 6 ¼” H X 6” top. Dimensions – Closes to 15”.